UFC Future Odds: Who is Brock Lesnar Fighting? The cat is out in the bag. Brock Lesnar is coming back to the UFC while still competing with the WWE. Lesnar, one of combat sports' biggest stars if not the biggest, is a box office monster for both UFC and WWE and it only makes sense for him to have the leeway to negotiate his contracts. Dana White confirmed during the UFC 223 pre-fight press conference about Lesnar returning and more reports came out following Wrestlemania that he re-signed a new contract with the WWE. It's a question of when Lesnar returns as he still has to re-enter the USADA drug testing pool and has to finish his suspension following his positive test after his UFC 200 bout against Mark Hunt. It's big news but not shocking as Lesnar was still under contract with the UFC and he repeatedly expressed his interest in fighting again. Lesnar, 40, is 4-3-1 under the UFC and once held the heavyweight championship before dropping it to Cain Velasquez. Due to his star power, White stated he will likely be fighting the winner of Stipe Miocic and Daniel Cormier set for UFC 226 during International Fight Week. A "tune-up" wouldn't be necessary and given Lesnar's age, he needs the biggest fights as soon as possible. The UFC is starved for money and the lack of other stars makes this fight a no-brainer. The question is, who wins between Miocic and Cormier? Both men have been dominant. Miocic hasn't lost a fight in four years and avenged that loss to Junior dos Santos with a first-round knockout. He's pretty much "cleaned out" the division and there are no outstanding contenders, which is why he is scheduled to fight light heavyweight kingpin Cormier. Cormier is undefeated at heavyweight and holds notable wins over former UFC champions Josh Barnett and Frank Mir. His only loss in his MMA career have come against Jon Jones and with Jones's recent doping scandals, those losses appear aberrant. Miocic is the deserved favourite (-190) due to his size and boxing. Cormier (+155) will have a reach disadvantage and will have difficulty closing the distance on Miocic who can pick him apart. Cormier's strength, his wrestling, could also be reduced by Miocic's own wrestling pedigree. A win for either fighter greatly bolsters their star power and makes the case for a "superfight" with Lesnar. Outside Miocic and Cormier, there is only one other notable fight for Lesnar: Jon Jones (+300). The UFC's prodigal son is awaiting his fate following yet another positive test for performance-enhancing drugs (PED) in his fight against Cormier. Jones looked horrible in his hearing with the California State Athletic Commission (CSAC) and was fined and had his fighting license revoked. This could parlay into a more drastic punishment from USADA as he is a repeat offender. Jones might be looking at a two to four-year suspension from USADA and this was the case, the Lesnar fight could be all but dead. But if he, once again, receives but a slap on the wrist and a one-year ban, the timeline could perfectly align with Lesnar's return. Jones versus Lesnar will easily be the biggest fight the UFC can make. If none of the options above work, the UFC could "feed" Stefan Struve (+850) to Lesnar to make him look good. The Dutchman is also a seven-footer and will dwarf Lesnar making this a freak show fight of gigantic proportions. 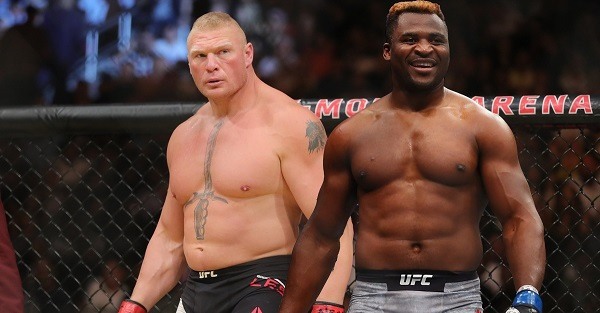 Heavyweight contender Francis Ngannou (+900) also called out Lesnar recently. The Cameroonian fell short in his bid to dethrone Miocic for the title but has the physique and knockout power to make a fight with Lesnar enticing. Although Ngannou would be better off getting back on the win column to really sell this fight and the UFC may not be willing to risk either guy losing to each other just yet. A rematch with Mark Hunt (+2500) is unlikely. Other unlisted fights include a potential rematch with former champion Cain Velasquez or a fight against budding star Derrick Lewis, the "Black Beast". Regardless, Lesnar is the draw here and even if it's an unknown fighter or a literal tomato can, he easily becomes the UFC's top star once he's officially exchanging leather. Lesnar's return to UFC excites both wrestling and MMA fans. The freak of nature is a once-in-a-lifetime talent and once his name is thrown around against several fighters, expect online sportsbooks to quickly open lines for him. Canadians will be among the first to get into the action and thankfully, these books serve them.